This travertine should not be compared to cheaper, less dense, less durable, tiles which required a much higher percentage of filling during fitting. The floor in our picture was tiled from our existing stock of this stone and so is perfectly representitive of what your floor will look like. 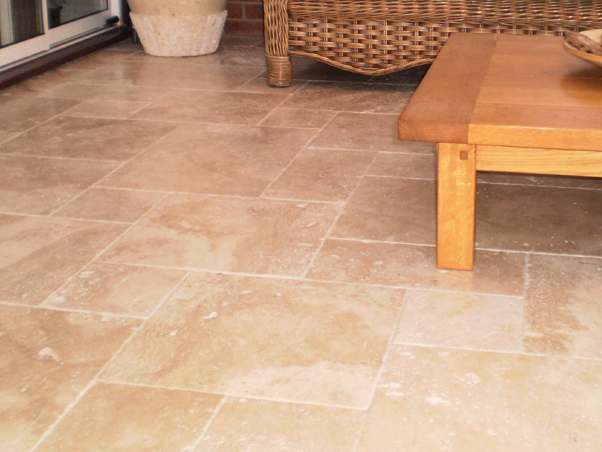 Tumbled travertine always look best unfilled from the quarry because it adds to the character of the floor. The filling should be carried out during fitting using a fine grain colour matching grout. We recommend Mapei and in this case their beige grout (colour code 132) is perfect. This tile grout is waterproof and highly mould resistent so it will not discolour and is easy to keep clean. The stone is plenty hard wearing enough for use in high traffice areas. The colour and large format of the travertine is very much in keeping with current trends and demand for bigger pieces of stone for tiling onto both floors and walls.